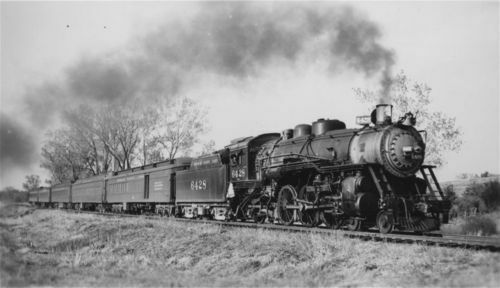 This black and white photograph shows Missouri Pacific steam locomotive #6428 pulling a coal tender, mail freight car, and four passenger cars. The photograph was taken at Topeka and 37th Street in Topeka, Kansas. In describing Kansas transportation past and present, the transportation by train is an important part of the discussion. Use this photograph in a sequence to show how transportation has changed over time.